We went in search of the ultimate comfort food in Center City Anaheim for a little Thanksgiving meal inspiration—and we were not disappointed. We also learned a valuable lesson in the process: there is no such thing as bad macaroni and cheese. Some are better than others, and some are more exotic, and some barely resemble the old standby Kraft Macaroni & Cheese in the reassuring blue box, but it’s all good. So we tracked down the best mac and cheese dishes in and around the Packing District to help you complete your holiday menu. Georgia’s in the Packing House is a real-deal, honest-to-goodness Southern restaurant and we had high hopes for their cheesy creation. Again, it’s only a side dish here, but when you accompany it with golden fried chicken, mashed potatoes, collard greens, and corn bread, it pretty much checks all the boxes for comfort food, and everything here tastes fresh and homemade. 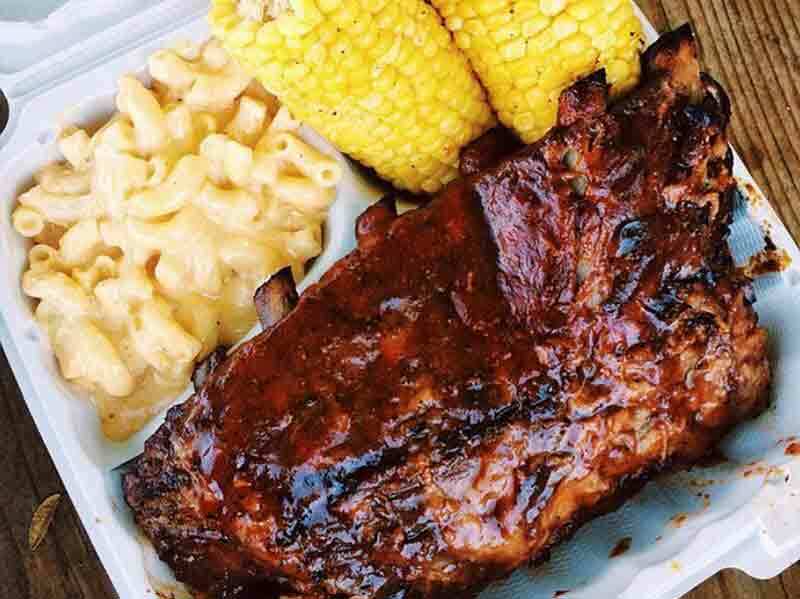 ‘Soulful Sides’ mac & cheese dish with a half rack of St. Louis BBQ Ribs and corn on the cob from Georgia’s Restaurant. Back over on the Center Street Promenade you’ll find Primo Sports Bar & Grill (formerly Cafe Primo, who formerly served an exquisite lobster macaroni and cheese, but let’s try not to think about that). 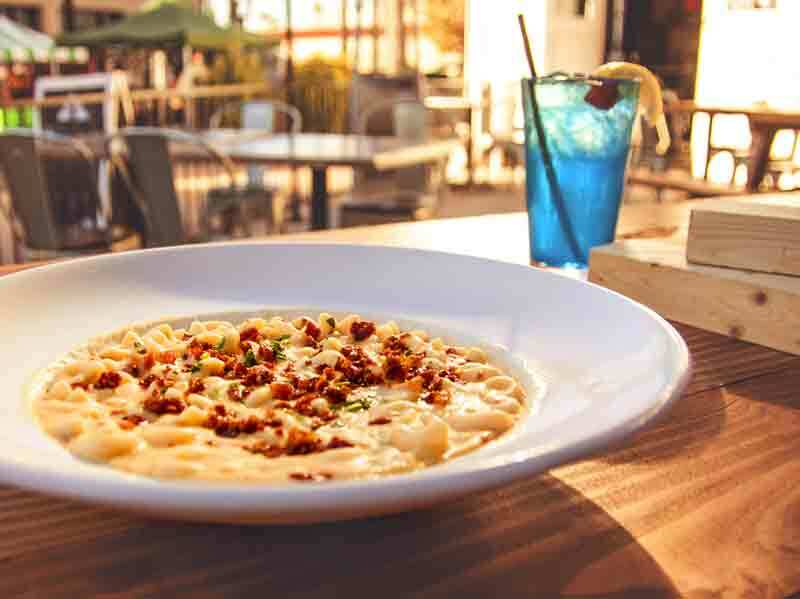 Their latest version of mac ‘n’ cheese comes as a glorious main dish topped with crispy bacon. Now we’re getting somewhere. Elbow macaroni, toasty bread crumbs, bacon bits, and chives take this dish up a notch. Bonus order: they also serve bacon mac ‘n’ cheese balls if you don’t want a meal or if you prefer spherical food. Primo Sports Bar’s ‘Bacon Mac N’ Cheese’ with bread crumbs, bacon bits, and chives. 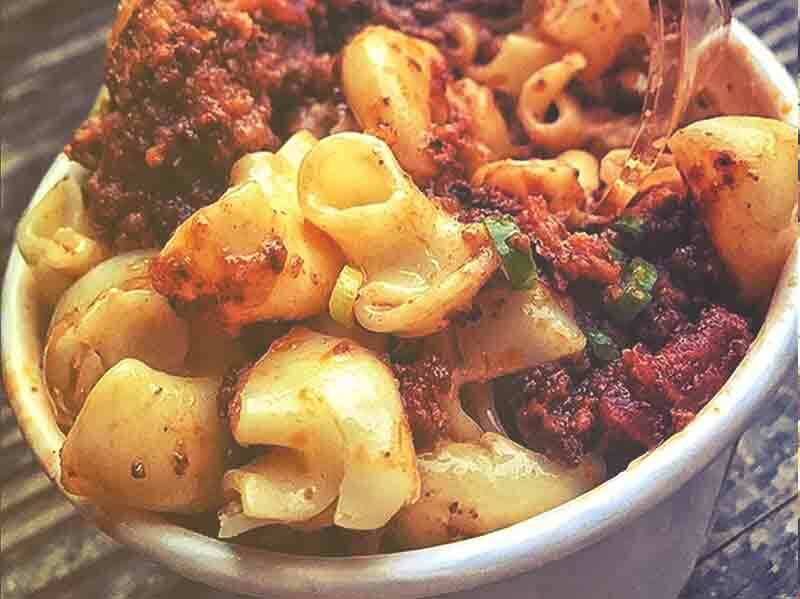 The Kroft (in the Packing House) dials up the heat on their Chili Mac ‘N’ Cheese with macaroni, cheese sauce, chili, bacon, herb breadcrumbs, and green onions. Again, this one’s only a side dish, but a hearty one at that. Mac and Cheese with chili, bacon, herb breadcrumbs, and green onions at The Kroft restaurant. This list would be woefully incomplete without including the enigmatic Blind Rabbit. This speakeasy bar is in the Packing House and is hidden behind a wall of sake barrels downstairs next to the hot pot restaurant. Look for the tiny brass rabbit for your way in, but be sure you have a reservation, the secret password, and an appetite for exotic food and craft cocktails. If you remember nothing else about your day in Center City, you’ll remember the Duck Confit Mac & Cheese. With savory duck, al dente cavatappi macaroni, and a three-cheese béchamel sauce, topped with shaved Parmesan and fried garlic bits, this is one that raises the bar. You can find directions to Anaheim’s restaurants with the best macaroni and cheese here.